:Sailing and soldiering around the world has taken Caleb O'Shea far from his native Ireland, so he never imagined that a promise to see a fellow crewman safely home would practically land him on his brother's doorstep. After spending years away from his family, Caleb isn't certain what kind of reception he will receive when he steps foot in Natchez, Mississippi. The one thing he knows for sure is that he won't stay long. Since her sister was kidnapped by river pirates six months ago, Alanah Adams has taken special care to avoid drawing attention to herself. Those living in the rough-and-tumble settlement of Cypress Creek might even think she's addled. But when she stumbles into Caleb and his friends in Natchez, she appears to be the picture-perfect lady. Caleb only catches glimpses of the mysterious and beautiful Alanah before she disappears. But a chance encounter with her at his brother's logging camp near Cypress Creek leaves him uncomfortable at the thought of the young woman traversing the dangerous area alone. At a crossroads in his life, Caleb must decide whether he wants to give up the worldly adventures he's been seeking for one closer to home. 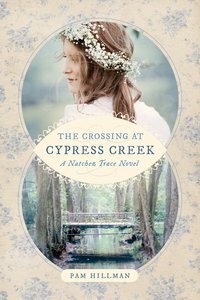 About "The Crossing At Cypress Creek (Natchez Trace Novel Series)"